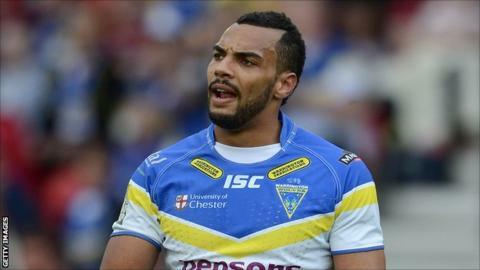 Warrington centre Ryan Atkins has said missing out on the 2011 Grand Final will help to motivate him in this season's Super League play-offs. The Wire had topped the Super League table but were narrowly beaten by Leeds one step short of Old Trafford. "It will be motivation for some players because you look back and it hurts," Atkins told BBC Radio Merseyside. "There will be different things that players use to get that edge and it probably won't be my sole motivation." England international Atkins continued: "This is a different season, we've got a different team, we've got different tactics and different attitudes. "We're going for it this year and, if we don't get it this year, we know it will be down to us. We can't blame anyone else, it will be down to our poor performances." Their first play-off match at home to local rivals St Helens on Saturday, and although the Wire know a defeat will not end their season as they will get another chance to reach the semi-finals the following week, Atkins says Warrington will approach it as a knockout game. "It brings the best out of us, as we've shown in the Challenge Cup runs we've been on in the last few seasons," he added. "We will be focusing on it as a knockout game, hopefully to get that week off next week. "It's one of those games that you want to be involved in. I've played in derbies for my previous club Wakefield against Castleford and that's a good derby, but Warrington against St Helens is totally different."